Indoor safe heating innovation is where Mr. Heater leads the way. 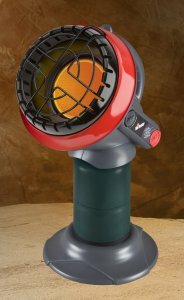 The Little BuddyTM indoor safe propane heater is the latest evolution in compact portable heat for enjoyable comfort with safety in mind. Easy to use and easy to store, the Little Buddy is perfect for heating workshops, hobby spaces, enclosed porches, hunting blinds, and campers. Little Buddy's radiant heating technology, like the sun, heats people and objects which in turn heat the surrounding space. It's heat that you can feel instantly. Plus, it features an indoor safe low oxygen safety shut-off (ODS) and a tip-over safety shut-off. And with 3,800 BTU's/HR, the Little Buddy is the right-sized solution for instant heat when you need it, where you need it.